The Rasmussen Reports daily Presidential Tracking Poll for Friday shows that 27% of the nation's voters Strongly Approve of the way that Barack Obama is performing his role as President. 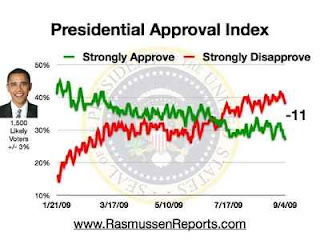 Thirty-eight percent (38%) Strongly Disapprove giving Obama a Presidential Approval Index rating of -11 (see trends). Over the past month, public opinion of the town hall protesters improved. Most voters believe that the primary purpose of the town hall meetings should be for Members of Congress to listen rather than speak. Sixty percent (60%) of voters believe tax hikes are bad for the economy. Of the Kennedy brothers, 61% believe that former President John F. Kennedy had the most positive lasting impact on the nation. The Presidential Approval Index is calculated by subtracting the number who Strongly Disapprove from the number who Strongly Approve. It is updated daily at 9:30 a.m. Eastern (sign up for free daily e-mail update). Updates also available on Twitter and Facebook. Overall, 48% of voters say they at least somewhat approve of the President's performance. Fifty-two percent (52%) now disapprove. A Month-by-Month Review of the President’s ratings shows that the Presidential Approval Index served as a leading indicator by declining months before the President’s overall job approval ratings fell. Football fans see the Patriots and Steelers as most likely to win the Super Bowl this season. Baseball fans see the Yankees as most likely to win the World Series. Republicans have opened their largest lead yet over Democrats on the Generic Congressional Ballot. However, Republican voters say that GOP representatives in Congress are still out of touch with the party base. Fifty-one percent (51%) say that Congress is too liberal while 22% say it’s too conservative. Thirty-four percent (34%) say the country is generally heading in the right direction. Sixty-eight percent (68%) believe that the passage of the Congressional health care reform plan will increase the deficit. A Rasmussen video report shows that 47% now expect their own taxes to go up during the Obama years. That’s the highest total yet. Scott Rasmussen has recently had three analysis columns published in the Wall Street Journal. The most recent was on health care. Earlier columns were on the President’s approval ratings and how Obama won the White House by campaigning like Ronald Reagan. If you'd like Scott Rasmussen to speak at your meeting, retreat, or conference, contact Premiere Speakers Bureau. You can also learn about Scott's favorite place on earth or his time working with hockey legend Gordie Howe. 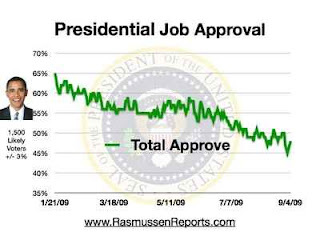 It is important to remember that the Rasmussen Reports job approval ratings are based upon a sample of likely voters. Some other firms base their approval ratings on samples of all adults. President Obama's numbers are always several points higher in a poll of adults rather than likely voters. That's because some of the President's most enthusiastic supporters, such as young adults, are less likely to turn out to vote. Other factors are also important to consider when comparing Job Approval ratings from different polling firms. While much commentary has been written about how tough August was for Democrats, a review of the data suggests July was really the tougher month. The President’s Job Approval ratings fell more sharply in July than August. Additionally, the number of people who consider themselves Democrats fell to a two-year low in July before inching up slightly in August. Overall, 37.3% of Americans now consider themselves Democrats while 32.6% are Republicans. A Fordham University professor rated the national pollsters on their record in Election 2008. We also have provided a summary of our results for your review. In 2008, Obama won 53%-46% and our final poll showed Obama winning 52% to 46%. While we were pleased with the final result, Rasmussen Reports was especially pleased that our data was the least volatile of all the tracking polls. Our daily tracking showed Obama with a stable and solid lead with more than 50% of the vote every single day for the last six weeks of the campaign. In 2004 George W. Bush received 50.7% of the vote while John Kerry earned 48.3%. Rasmussen Reports was the only firm to project both candidates’ totals within half a percentage point by projecting that Bush would win 50.2% to 48.5%. (see our 2004 results). Daily tracking results are collected via telephone surveys of 500 likely voters per night and reported on a three-day rolling average basis. The margin of sampling error—for the full sample of 1,500 Likely Voters--is +/- 3 percentage points with a 95% level of confidence. Results are also compiled on a full-week basis and crosstabs for full-week results are available for Premium Members. Like all polling firms, Rasmussen Reports weights its data to reflect the population at large (see methodology). Among other targets, Rasmussen Reports weights data by political party affiliation using a dynamic weighting process. While partisan affiliation is generally quite stable over time, there are a fair number of people who waver between allegiance to a particular party or independent status. Over the past four years, the number of Democrats in the country has increased while the number of Republicans has decreased. Our baseline targets are established based upon separate survey interviews with a sample of adults nationwide completed during the preceding three months (a total of 45,000 interviews) and targets are updated monthly. Currently, the baseline targets for the adult population are 37.7% Democrats, 32.7% Republicans, and 29.6% unaffiliated. Likely voter samples typically show a slightly smaller advantage for the Democrats. A review of last week’s key polls is posted each Saturday morning. Other stats on Obama are updated daily on the Rasmussen Reports Obama By the Numbers page. We also invite you to review other recent demographic highlights from the tracking polls.